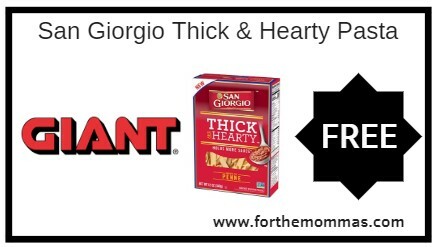 Giant: FREE San Giorgio Thick & Hearty Pasta Thru 11/22! Here is a nice deal to snag if you are headed to Giant. You can score San Giorgio Thick & Hearty Pasta for Free with a coupon. 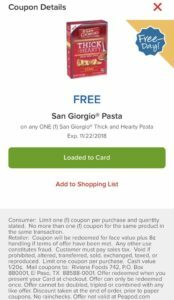 This coupon is good for one San Giorgio Thick & Hearty Pasta . You will need to load the digital coupon by 11/09 and redeem by 11/22.